This painting portrays the artist with his wife, Emma, and daughter, Anne, on vacation on Monhegan Island off the coast of Maine. Two neighbor children occupy the right side of the canvas. 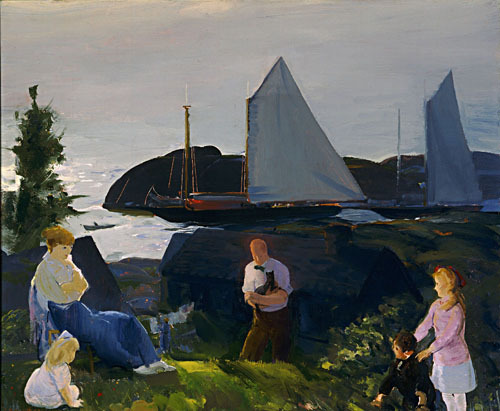 In the summer of 1914, painter George Bellows convinced his wife, Emma, to travel to Monhegan Island off the coast of Maine along with their young daughter, Anne. There, he hoped to paint more of the stunning seascapes he had worked on so successfully in past years. Evening Group depicts Emma and Anne on the left, the artist in the middle, and two neighbor children on the right. Based in New York City during much of the year, Bellows found that the harsh beauty of places like Monhegan Island provided him with subjects that contrasted dramatically with his acclaimed urban scenes. He first visited the island in 1911 in the company of his teacher and mentor, Robert Henri, and wrote enthusiastically to Emma: "The Island is only a mile wide and two miles long, but it looks as large as the Rocky Mountains. It's three times as high as Montauk [Long Island] and all black and grey rock. Beautiful pine forests and wonderful varieties of all kinds." In another letter, he lamented "my head is full of millions of great pictures which I will never have time to paint."